Ingredients: Hemp hearts (shelled hemp seeds) organic brown rice syrup, organic evaporated cane sugar, organic cinnamon, organic cinnamon with other natural flavours, sea salt. They are really good! I will definitely buy them again! 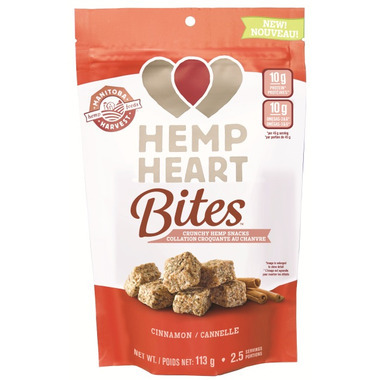 I was pleasantly surprised by these hemp bites! They definitely have that hemp taste but it's followed up nicely by the cinnamon and a light sweet and saltiness. I can't count how many bags of hemp I've bought and never finished. This is such a convenient way to get a dose of healthy fats and (plant based) protein. Considering how large the serving size is, the sugar content is fairly low as well. Would definitely buy again! These little bites are AMAZING! I had never tried these and was pleasantly surprised. They are the perfect â€œon the goâ€� snack and they are quite filling. I definately will be bying more and trying other flavors. Packed full of flavor! Takes away sweet or salty cravings and is good for you. I usually only need 3 squares to feel satisfied. I love all the Manitoba Harvest products, but this is one of my favs.